Sunday, Feb 25th, Cinemaslice.com presented its first independent movie event at the State Theatre in Bay City, MI. “Buy. Sell. Trade.”, “Hell to Pay”, and “DARKLING” were on the bill. It was a great chance to watch these locally made films in the bona fide theatrical venue that they deserve. With genres spanning from comedy to psychological thriller, there was a little bit of everything for everyone. The afternoon started off with an homage to Kevin Smith’s “Clerks” with the film “Buy. Sell. Trade.” directed by Brandon Guiles and Cory Hearns. This slice of life comedy tells of Carl, a young video game business owner, who finds out he has until the end of the day to come up with 5000 dollars to pay of loans or he will be forced to close. With the help(?) of his coworkers, family, and friends, will he be able to save his dream. I feel that the heart of this film lies in the hilarious interactions between Carl and his coworker/best friend, Jeff. These two come off as very genuine and I was invested in what was going to happen to them up to the very end. I feel that maybe a bit more of a deeper dive into Carl and, in particular, Jeff’s history with the store could have explained a bit better why they were so passionate about their job. This is a minor grip, however, considering that Carls drive to want to succeed is evident through the interactions with his family. Overall very enjoyable movie. 5 out of 6 reels. After a short intermission, a short film by Nic White was shown. “Hell to Pay” is a horror/comedy about a man who appears to have sold his soul to the devil, with hilarious results. It was a nice transition from the more comedic “Buy. Sell. Trade.” to the more disturbing “DARKLING”, which was to follow. Short and sweet. 5 out of 6 reels. 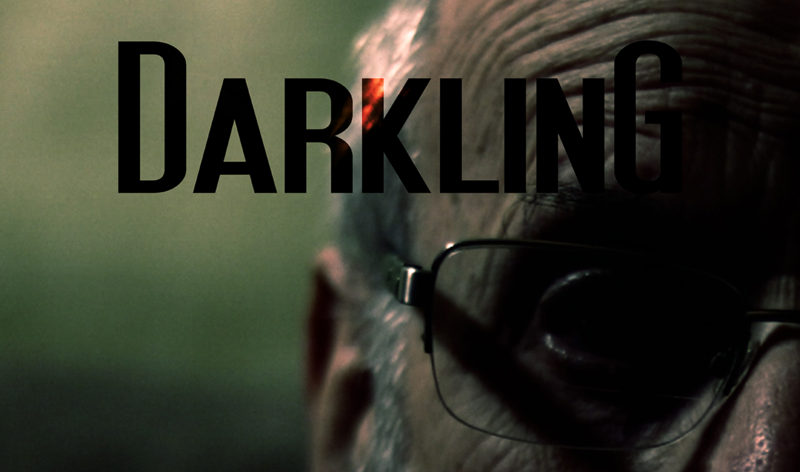 “DARKLING”, directed by Michael Welborn, is a psychological thriller about a man whose life slowly spirals out of control when a traumatic event happens, an event that he feels he could have prevented. The sound design in this film is phenomenal. Everything from the songs to the sound effects have the feeling that they were really chosen and crafted with great care. It’s John Carpenters “Halloween” good. The other elements of the movie, such as the acting and directing, are also really solid throughout. There are scenes in the first 2/3rds of the movie that will have you questioning if you’re actually watching a local, low budget film. The only criticism I have is a scene change near the end of the film, introducing two detectives, that is a bit jarring and threw off the pacing of the film for me. Very well crafted and frightening. 6 out of 6 reels. I am an avid moviegoer. I usually see at least two films a week at the theater and it’s really great to see these events put on where smaller, lower budget, independent films get a chance to be shown on the big screen. Don’t get me wrong I love watching a movie at my house. In fact my first viewing of “DARKLING” was on an iPad on my couch, but watching it at The State Theatre for me was a vastly different experience altogether. The event was enjoyable and I look forward to more in the future. This SUNDAY (2/25/2018) we’re releasing DARKLING on the big screen in Bay City, MI, and we’re considering this the inaugural event for our CSX series! CSX (CinemaSlice Convention) is a convening of Slicers— a gathering of collaborators and fans of CinemaSlice— to celebrate the artistic efforts of which we dedicate our lives. Join us on February 25th, 2018 at the State Theatre in Bay City Michigan for CSX:I, the first ever CinemaSlice Convention! Interested in attending the ever CSX?? Tickets are $7 and can be purchased at the door or online here. CinemaSlice.com is proud to present another first for us: the theatrical release of an original film!